The Pied Currawong (Strepera graculina) is a medium-sized black passerine bird native to eastern Australia and Lord Howe Island. It is closely related to the butcherbirds and Australian Magpie of the family Artamidae. Six subspecies are recognised. It is a robust crow-like bird averaging around 48 cm (19 in) in length, black in plumage with white undertail and wing patches, yellow irises, and a heavy bill. The Pied Currawong is omnivorous; its food includes a wide variety of berries and seeds, invertebrates (i.e., insects) and bird eggs and juvenile birds. It is a predator which has adapted well to urbanization and can be found in parks and gardens as well as rural woodland. The Pied Currawong was first described by English ornithologist George Shaw in 1790 as Coracias strepera, although Strepera was adopted as a generic name. Its specific names were derived from the Latin strepera "noisy", and graculina, resembling a Jackdaw, though Grackles of the genus Gracula are members of the Sturnidae. Its closest relative is the Black Currawong (S. fuliginosa) of Tasmania, which has sometimes been considered a subspecies. Though crow-like in appearance and habits, it is only distantly related to true crows, instead it belongs to the family Artamidae, together with the closely related Australian Magpie and the butcherbirds. Like almost all of these birds, it has adapted very well to urbanization. Six subspecies are currently recognised, differing mainly in size and the amount of white in the tail. Overall plumage lightens (from black to a greyish black), body size increases and the bill slightly shortens as one moves from north to south. The amount of white in the tail increases, but on the wing decreases. S. graculina graculina is the nominate form, found from the Sydney region north to the Burdekin River in northern Queensland. S. graculina crissalis - (Vulnerable) - The Lord Howe Island Currawong appears to have adapted well to human habitation on Lord Howe Island, though the population is small overall, somewhere around 70 birds. S. graculina magnirostris is found on the Cape York Peninsula to the Normanby River in northern Queensland. S. graculina robinsoni is found on the Atherton Tableland in northeastern Queensland; it is combined with magnirostris by some authors. S. graculina nebulosa, found in southeastern New South Wales, the Australian Capital Territory and central Victoria, is very similar to the nominate subspecies but has a shorter bill, longer tail and larger wing. Its plumage is described as sooty black. 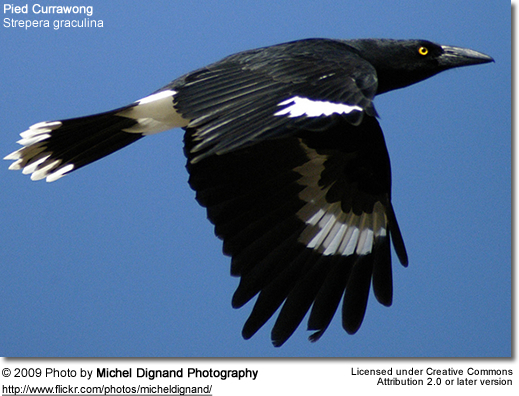 The Pied Currawong is generally a black bird with white in the wing, undertail covets, the base of the tail and (most visibly) the tip of the tail. It also has yellow eyes. Size is about 44-50 cm (17-19 in), with an average of around 48 cm (19 in), the wingspan varies from 56 to 77 cm, average around 69 cm. Adult males average around 320 g (11 oz), females 280 g (10 oz). The wings are long and broad. The long and heavy bill is about one and a half times as long as the head and is hooked at the end. The loud distinctive call has been translated as Kadow-Kadang or Curra-wong. Birds also have a high-pitched but loud whistle. The endemic Lord Howe Island subspecies has a distinct, more melodious call. Along with magpies and butcherbirds, it has one of the most hauntingly beautiful caroling calls of any Australian songbird, and is eclipsed, perhaps, only by the Grey Shrike-thrush and the lyrebirds. It is common in woodland, rural and semi-urban environments throughout eastern Australia, from Cape York to western Victoria and Lord Howe Island, where it occurs as an endemic subspecies. It seems to have adapted well to European presence, and has become more common in some urban areas such as Sydney. Unlike many birds, Pied Currawongs have suffered little from European occupation of the land. Settlers and successive generations have replaced much of the natural woodland and forest with vast artificial grasslands, where Currawongs are seldom seen. Scattered patches of remaining bush appear to be sufficient for their needs and the provision of irrigated waypoints along their rambling migration routes has encouraged them to take up residence in areas where they previously only overflew. The effect of this on smaller birds that are vulnerable to nest predation is controversial: several studies have suggested that Pied Currawongs have become a serious problem, but the truth of this widely held perception remains to be established. They appear to thrive on berries of some introduced species, some of which themselves are pests, such as the Camphor laurel (Cinnamomum camphora). Pied Currawongs are generally tree dwelling, hunting and foraging some metres above the ground, and thus able to share territory with the ground-foraging Australian Magpie. The Pied Currawong is an omnivorous and opportunistic feeder, eating fruit and berries as well as preying on many invertebrates (i.e., insects), and smaller vertebrates; mostly juvenile birds and bird eggs. Currawongs will hunt in trees, snatching birds and eggs from nests, as well as insects and berries from trees. They also hunt in the air and on the ground. They will often scavenge, eating scraps and rubbish and can be quite bold when seeking food from people. The species has been reported stealing food from other birds such as the Australian Hobby (Falco longipennis), Collared Sparrowhawk (Accipiter cirrocephalus ), and Sulphur-crested Cockatoo (Cacatua galerita). Pied Currawongs will also harass each other. The Pied Currawong builds a nest of thin sticks lined with grass and bark high in trees in spring; generally eucalypts are chosen and never isolated ones. It produces a clutch of three light pinkish-brown eggs, likened by one author to the colour of silly putty, with splotches of darker pink-brown and lavender. Tapered oval in shape, they measure about 30 x 42 mm (1 x 1.5 in). The female broods alone. The incubation period is not well known due to the difficulty of observing nests, but observations indicate around 30 days from laying to hatching. Like all passerines, the chicks are altricial and nidicolous. Chicks are born naked, and blind, and quickly grow a layer of ashy-grey down. Both parents feed young, although the male doesn't begin to feed them directly until a few days after birth. Higgins, Peter Jeffrey, John M. Peter, and S. J. Cowling (eds.) (2006). Handbook of Australian, New Zealand and Antarctic Birds. Vol. 7: Boatbill to Starlings. Melbourne: Oxford University Press. ISBN 978-0195539967.